iNew V3 Plus review, available at heavy discount on Gearbest. You are here: Home / Android / iNew V3 Plus available at heavy discount on Gearbest. With the entry of many Chinese devices into smartphone, consumers have many choices while buying new devices. In these days of mobile computing, people usually prefer to buy phablets which act like smartphone as well as tablets. Following this trend, iNew has launched its new phablet, iNew Android 4.4.4 which is available at great discount on Gearbest. 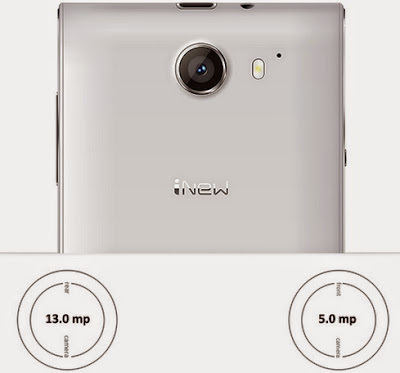 iNew V3 plus has been designed efficiently keeping in mind the latest design trends. The front of the device have three regular capacitive buttons. The device measures around 143 x 71 x 6.5mm and weighs about 128 grams. On the top there is earpiece along with front facing camera and sensors. There are 2 dual speakers present at the bottom which are good for providing surround sound. The volume rocker is present on the right whereas the power key is present on the left. You might find this combination little tricky, since most Samsung and Sony phones have present it on right side. The micro USB cable is present on the top alongside 3.5 mm earphone. At the rear side, you will find main camera with LED flash and an additional microphone for effective noise cancellation. Under the hood, it packs MT6592M octa core Mediatek processor, which is the true octa core processor clocked at 1.7 GHz. The graphics are boosted by Mali 450 GPU, which alongside with MT6592 provides buttery performance. It runs on Android v4.4, Android KitKat which is nearly close to the stock Android version. There is beautiful display of 5 inches but that comes with 720p resolution, which is little disappointing. But still, it packs more pixels, about 326 which will make everything look so crispy. The display is also protected by Gorilla Glass 2, which makes it anti-scratch resistant. It’s truly a masterpiece I’d say, which is coming at an affordable price tag. You won’t get disappointed when it comes to imaging. The main snapper is 13 megapixels which has all latest features like auto-detect, LED flash, auto-focus, face detection, etc. The front camera is 5 megapixels, which is great enough to capture selfies and group photos. You can even record HD videos with the main camera. We have recently posted about iNew v8 also, you can check out more details. Its dual SIM android device, with dual standby which enables to keep two SIM’s active at the same time. You can use internet through EDGE, 3G and Wi-Fi. This smartphone works with GSM + WCDMA network worldwide. However, I’d recommend you to check if it is compatible with frequency in your country. You can click here to find out Network frequency of your country. As stated earlier there is micro USB port, 3.5 mm jack along with Bluetooth and GPS. It boasts internal storage of about 16 GB which is good enough to install lots of apps and games. Most of the Android games these days are huge in size (around 1-2 GB), so installing it on low memory devices becomes huge problem. You can install on external SD card on few devices, but the performance is not similar as you’d get when app is installed on device. Apart from internal memory of 16 GB, you can even expand it further up to 32 GB through micro SD card slot. The power needs are managed by 1830 mah battery which is less as compared to other competitors. This is most probably to keep it light weight. You can easily squeeze in full day of usage on single charge. You even get multiple languages like Thai, Arabic, Romani, Greek, Turkish, etc. You can buy iNew V3 plus from Gearbest for $170.11. You can avail 10% discount when you use coupon code “PLUSCN”, so the effective price would be $156. So, the effective price is less than price of Amazon, which is about $189.89. The package contains the smartphone, power cable, screen protector, battery, USB cable, leather case, earphones and user manual. I got the ivew v8 for $195.99 from gearbest, as I used the coupon GBV8CN to purchase it, this coupon is still available, it valid from Dec 31st, if there is anyone else who what to buy one, try it out.